With a capitalization of the maximum amount of the mobile market share, an android application development project can deliver your business way into the enormous amount of target audiences. With an advanced android app, you can make sure finest user experience getting better business conversion ratio. Our iOS developers have been offering high quality feature-rich native iOS mobile application development services to clients around the world. The mobile user experience proves to be a significant part of the mobile application development process. We provide diverse apps for iPhone and iPad mobile development. A native iOS application is the best way to provide the finest experience to the perceptive target audiences. Deliver a native experience transversely to multiple mobile application development platforms with a pooled code. Native cross-platform applications allow your projects to be created with a shared “core”, yet still influence the native features of every solution platform. We have wide-ranging experience in building feature-rich HTML5 mobile application development tools. All the HTML5-based solutions we offer are safe, robust, secure and highly scalable. The web mobile application development solutions we build are maintained without any technology issues. 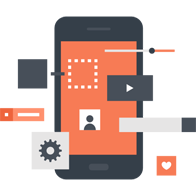 We being an enterprise mobile application development company, our certified and highly trained mobile developers deliver superior cross platform mobile application development technology features producing the most excellent applications. CONNECT WITH US RIGHT NOW!